Karl Lagerfeld is known for putting a unique and original spin on traditional runway shows. In March he transformed Paris's Grand Palais into a grocery store complete with real Chanel-branded grocery items, produce and hardware. 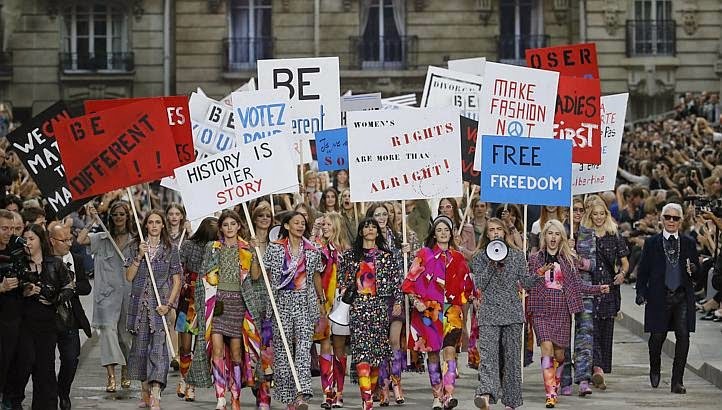 To showcase the Chanel Spring/Summer 2015 Ready-To-Wear collection Karl Lagerfeld paid homage to feminism by turning the runway into a Parisian street and staged a mock protest in support of women's rights. To end Paris Fashion Week Chanel's models, led by Cara Delevingne who chanted into a quilted megaphone embellished with the Chanel emblem, took to the street (runway) holding placards with hand written slogans including “Boys Should Get Pregnant, Too,” “History Is Her Story,” “Ladies First,” “Be Different,” and “Tweed is Better Than Tweet”. The show follows on the heels of Emma Watson's moving gender equality speech at the United Nations last week, which went viral on social media and raised global awareness for political, social and economic equality of the sexes. I really love the Chanel Spring/Summer 2015 Ready-To-Wear collection especially all the vibrant prints and sophisticated black and white fabrics with accent embellishments. It was really hard to choose my favourite designs in this collection but I have managed to come up with my top 10 best looks of the collection. Enjoy!